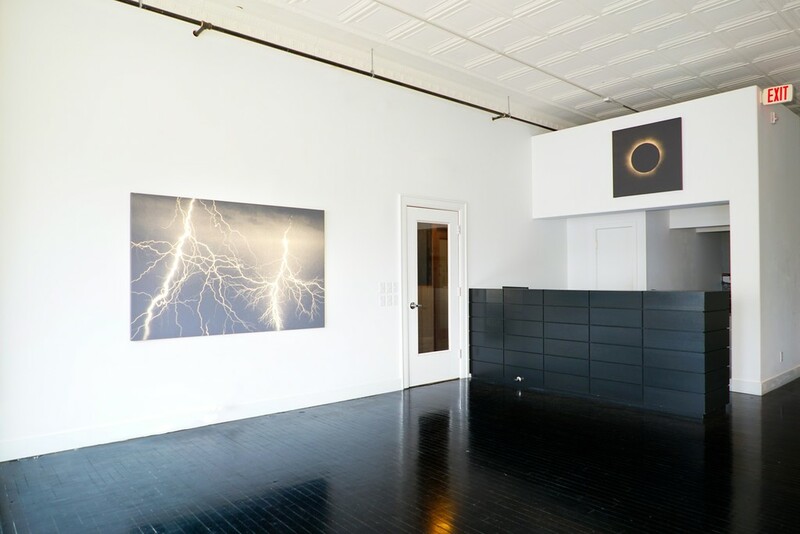 Angela Meleca Gallery is pleased to present "Exposure", Robert Buck's first solo exhibition in the gallery. The new works presented in this exhibition are a continuation of a series first created by Buck for an exhibition in October 2009, which were inspired in part by the introduction of the iPhone and its rear-facing camera. Those paintings, perhaps too prescient, a year ahead of the launch of the iPhone 4 and its LED flash, were placed in storage, save for a 2013 group show, and remained there until early 2016 when Angela Meleca asked to see them. As a consequence of that studio visit, Buck returned to the series, and the result is “Exposure”, a show of new “iPaintings”. The “iPaintings” might be mistaken for color field paintings if it weren’t for the surprise, depending on one’s vantage point, of the play of natural light that divulges a fallow image, luminous and alluring. 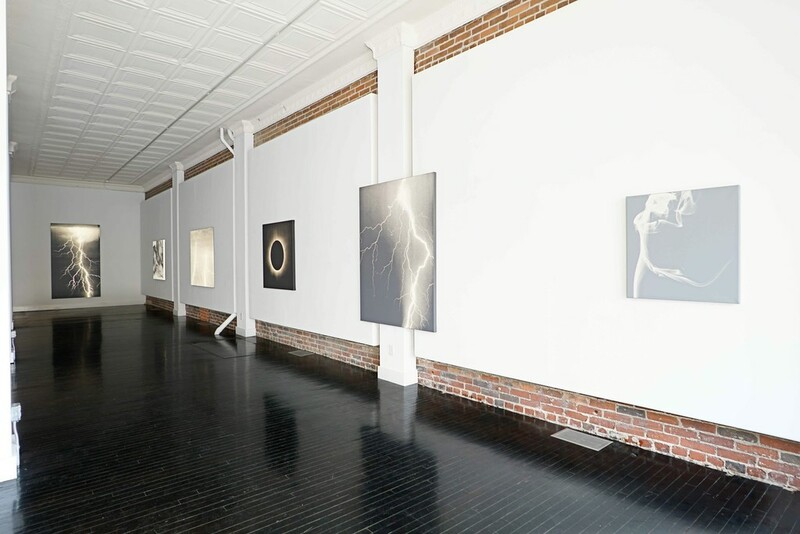 While the 2009 paintings depict plumes of smoke, the new works present other naturally occurring light phenomena, equally rich in association, such as inspiration and destruction, revelation and occultation. “Reproduction ready”, the “iPaintings” lead a double-life: the painting itself, alive before the eyes in the analog world, and its photographic image, captured on smartphones and circulated in the ethosphere. The paintings are made using a combination of acrylic and Alert paint, an oil-based industrial coating, which due to an additive of miniscule glass beads, is highly reflective. It’s most commonly used in military, aerospace, highway safety, and EMS industries. After screening a uniform field of acrylic paint of the same color as the coating onto primed canvas, Buck screens a photographic image over it with the reflective paint. Consequently, when the painting is illuminated, the Alert paint fluoresces while the acrylic does not, and the fallow image appears. Buck now considers the “iPaintings” to be among his signature works as they cipher abiding themes: the dormant image, the uncanny, erasure, the ineffable, camouflage, and the remainder. Metaphorically, the title “Exposure” radiates with the light required to detect the paintings latent image, the natural phenomena of illumination they depict, the over-sharing through social media, and the story of the “iPaintings” themselves. To effectuate the magic of the work, the opening will take place in the dark – or in the light viewers bring to it. A smaller section of his earlier "iPainting" series "smokescreens" will also be on view. The 2009 works depict plumes of smoke to suggest, among other things, 21st Century vanitas, a candle snuffed out, or glimpsing a face in the clouds. Robert Beck graduated from New York University’s Tisch School of the Arts Film and Television Department in 1982 and the Whitney Museum Independent Study Program in 1993. In 2008, Beck changed his father’s name as a work of art by a single vowel to Robert Buck. His work has been exhibited and collected internationally, including: Whitney Museum of American Art, New York; Museum of Modern Art, New York; San Francisco Museum of Modern Art; Wexner Center for the Arts, Columbus, OH; Galerie Rodolphe Janssen, Brussels, Belgium; Matisse Museum, Nice, France; Neue Gesellschaft fur bildende Kunst e.v., Berlin, Kunstverein, Hamburg, Germany; Kunstmuseum, Lucerne, Switzerland; Rennie Collection at Wing Sang, Vancouver; and the Pizzuti Collection, Columbus Ohio. He was a 1999 Louis Comfort Tiffany Foundation Award recipient. His work is now on view in the Whitney Museum’s “Human Interest: Portraits from the Whitney’s Collection”. 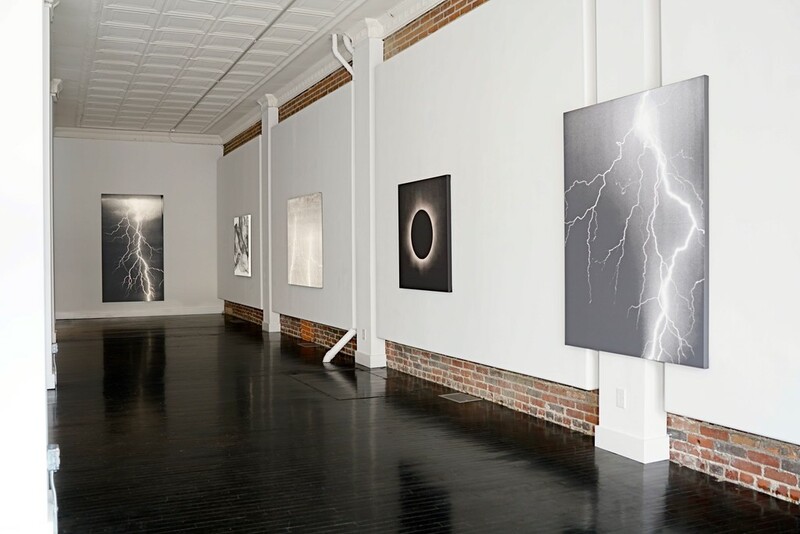 Buck’s work is represented by CRG Gallery, New York City, and Stephen Friedman Gallery, London. His moving image works are distributed by Electronic Arts Intermix, New York. Buck lives and works in New York City and the desert of Far West Texas.